Crayfish are best thought of as freshwater lobster. While they don’t grow as large as their salty cousins, they’re certainly much closer to home – burrowing in many riverbanks and lake beds across the UK. At the beginning of the twentieth century, native European crayfish were suffering from a plague. In a bid to protect fishing stocks the North American signal crayfish was introduced. This turned out to be a huge ecological facepalm: the new species was not only almost immune from the plague, but a carrier too. Annihilation of our native crayfish was the result. 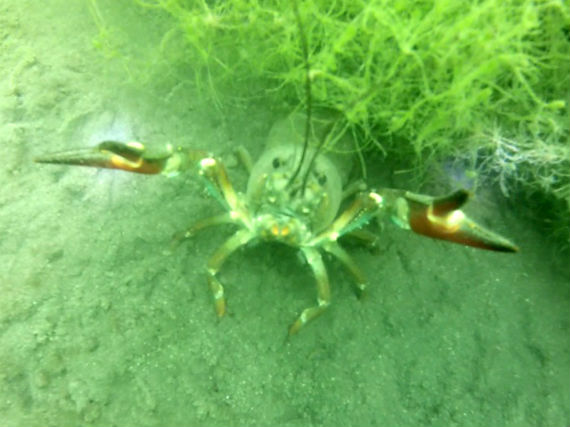 Signal crayfish are particularly hardy and have few predators – Perch being a notable exception. The name ‘signal’ crayfish comes from their flash of colour on the claw, rather like a flag – otherwise the body is a reddish brown colour, and typically 6-9cm in length, although they can be double that size. Signal crayfish are a disaster for other fresh water fish species too, because of their habitat. Their burrowing into riverbanks causes them to erode faster, and lake and river beds too are shorn of shingle, rendering them useless as fish breeding grounds. The silver lining is that crayfish make excellent eating, and you should tuck in with a clear conscience: they’d clearly eat you given half the chance, so you make as well strike first. Check out the Environment Agency website for info on trapping signal crayfish, and definitely take a bag next time you’re lake or river diving.